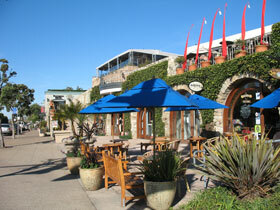 Posted November 24th, 2010 by Barry Berndes & filed under Attractions in Del Mar, Del Mar, Shopping, Specialty Malls. Shopping and dining take on a whole new perspective at the Del Mar Plaza, which is at the corner of Camino del Mar and 15th Street. 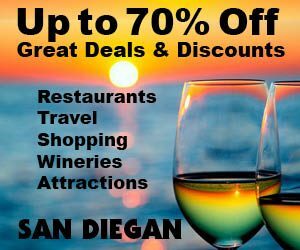 Breathtaking ocean views and more than 30 fine shops, boutiques and restaurants combine for one of the best shopping experiences in San Diego. Posted September 7th, 2009 by Barry Berndes & filed under American, Del Mar, Del Mar Restaurants, La Jolla, La Jolla Restaurants, Mission Valley, Mission Valley Restaurants, Restaurants. Posted June 16th, 2009 by Barry Berndes & filed under Attractions, Attractions in Del Mar, Del Mar, Farmers' Markets, North County Coastal. 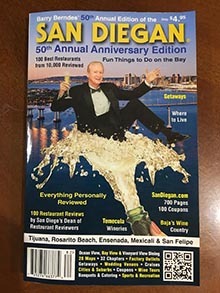 Posted May 20th, 2009 by Barry Berndes & filed under California Cuisine, Del Mar, Del Mar Restaurants, Happy Hour, Restaurants. Posted May 19th, 2009 by Barry Berndes & filed under Banquets & Catering, Corporate Meeting Venue, Del Mar, Del Mar Restaurants, Delivery, Encinitas, Encinitas Restaurants, Happy Hour, Italian, La Jolla, La Jolla Restaurants, North County Coastal, Party Venues, Pizza, Rancho Santa Fe, Rancho Santa Fe, Restaurants. Posted May 12th, 2009 by Barry Berndes & filed under Banquets & Catering, Del Mar, Del Mar Restaurants, happy hour, Happy Hour, MCRD Graduation Party Venues, North County Coastal, Restaurants, Seafood, Seafood Fine Dining, Seafood Market. Posted May 10th, 2008 by Barry Berndes & filed under Attractions in Del Mar, Del Mar, Del Mar Restaurants. Posted May 6th, 2008 by Barry Berndes & filed under Del Mar, Del Mar Restaurants, La Jolla, La Jolla Restaurants, Party Venues, Rehearsal Dinners, Restaurants, UTC. Posted April 8th, 2008 by Barry Berndes & filed under American, Barbecue, Carmel Valley, Chula Vista, cuisine, Del Mar, Del Mar Restaurants, Escondido, Escondido Restaurants, Happy Hour, La Jolla, La Jolla Restaurants, National City, National City Restaurants, North County Coastal, UTC. Posted January 7th, 2008 by Barry Berndes & filed under Cardiff-by-the-Sea, Carlsbad, Coronado, Del Mar, Encinitas, North County Coastal, Oceanside, Oceanside Harbor & Marina, Real Estate.